In a previous blog entry in July, I mentioned that Blue & Gold Fleet passengers boarding the ferry at Sausalito was paying for the wrong boat. This was due to a change in Golden Gate Ferry's policies where the trip from Sausalito to San Francisco (Ferry Building) changed from pay on board the boat (give ticket upon exit), to a prepaid system. This caused confusion as Blue & Gold's policy is to pay on the boat and surrender the ticket upon exiting. Due to all the confusion in policies, there were people paying Golden Gate, tagged their paper Clipper card upon entry, and boarded the Blue & Gold boat not realizing they'll have to pay an extra $10.50 to the cashier on the boat because they paid for the wrong one. The Clipper card readers at the dock's gate is now locked-out unless if a Golden Gate employee tags a special Clipper card to activate the readers. This means that if a Blue & Gold passenger accidentally buys a Golden Gate ticket, at least their ticket will still have a ride stored on it for a future trip. The huge time table at the dock clearly tells passengers how to pay for their ferry ride back to San Francisco. 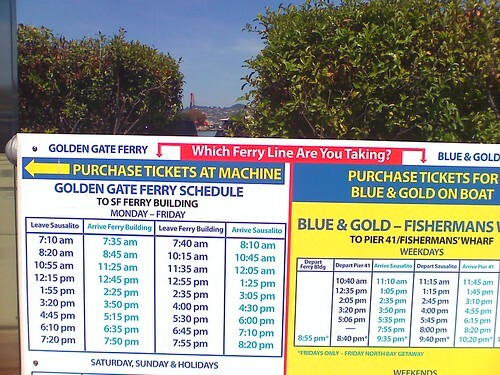 Golden Gate Ferry honors the Blue & Gold Fleet's paper vouchers to those who rented a bicycle from one of the vendors around Fisherman's Wharf. Still, they can make one improvement that's good for everyone: The automated machines at the Sausalito dock should ask passengers what ferry they plan to take to make sure people don't buy the wrong ticket. It's an improvement in the right direction, but I feel that both ferry companies can always strive to do better. On a final note, I found out the transfer policy for Golden Gate & Muni passengers has changed. The new benefit, it allows Muni pass users to save 50 cents on their boat ride. Using a Clipper card, you exit Golden Gate Ferry and board Muni and receive a 50 cent discount if used within 90 minutes. No credit/discount for Muni pass users. For the return trip to Golden Gate within 24 hours, tagging the same Clipper card on Muni receives a 50 cent discount on the Muni ride. No credit/discount for Muni pass users. Using a Clipper card, you exit Golden Gate Ferry and ride Muni to receive a 50 cent discount within 90 minutes. (same policy as #1 above). There's no credit/discount for Muni pass users. For the return trip to Golden Gate, you don't get the discount for Muni, but by taking Muni, your card gets encoded and you get a 50 cent discount on the ferry boat ride. This means no more 24-hour limit rule (especially great for commuters that doesn't ride on weekends). This even works if you have a Muni pass, you still save 50 cents on the ferry boat ride.